Battle..of the Planets! G-Force! Five incredible young people with superpowers! And watching over them from Centre Neptune, 7-Zark-7! Watching, warning against surprise attack by alien galaxies from beyond space! G-Force! Fearless young orphans, protecting Earth's entire galaxy! Always five, acting as one! Dedicated! Inseparable! Invincible! The first American version of Science Ninja Team Gatchaman. Heavily Macekred by the infamous Sandy Frank Productions. You know, the guy who dubbed the Gamera movies, Fugitive Alien, and Time of the Apes (and produced the 1984-85 Jim Lange-hosted version of the $100,000 Name That Tune). Hoyt Curtin, Hanna-Barbera's regular composer, wrote the score. 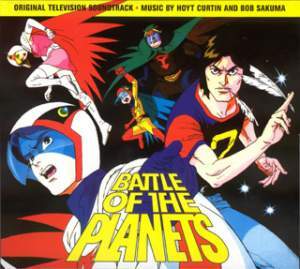 Battle of the Planets was one of the few anime that meets Alex Ross's approval, and some illustrations that he did for the series led to both him doing the cover illustrations of ADV Films release of Gatchaman and to a short-lived Revival comic series published by Top Cow Productions from 2003-2004, which tried to combine elements from both the original and the adaptation into a whole. Gold Key Comics released BOTP comics during the series' original run. A Continuity Reboot is currently in development under Tatsunoko, Nelvana and d-rights titled Battle of the Planets: Phoenix Ninjas. Adaptation Distillation: The Top Cow comics. All There in the Manual: Many minor characters' names and some other details were only given in the scripts. This site attempts to compile all this extra information. Anachronic Order: The episodes were sent to Sandy Frank out of order, leading them to wind up produced in a much different order than what was used for Gatchaman (and what Frank had initially intended for production of this version). Although the episodes are arranged in the Gatchaman order on DVD, the completed episodes wound up intended to be broadcasted and viewed in a completely different way. Watching them in the original Gatchaman order can create some confusion for new viewers, such as some episodes referring to events that have yet to happen, or 1-Rover-1 mysteriously coming and going. The suggested broadcast order by Sandy Frank fixes a few plotholes, yet also creates some of its own. Big Eater: Tiny, arguably Keyop. The final episode note based from Gatchaman/original production order. In Sandy Frank's suggested broadcast order, the "Invasion of Space Center" two-parter ends the series "The Conway Tape Tap" was a loose adaptation of Gatchaman #101 ("The Sniper Group Heavy-Cobra"), with a significant amount of footage edited out and replaced by Zark sequences, as well as footage spliced from a previous episode, "Decoys of Doom" (original title: "The Snow Demon King, Blizzarder"). "The Galaxy Girls" (originally "The Plan To Assassinate Dr. Nambu") was severely edited due to its content, with Jason seeming to just vanish partway through the episode and not showing up at the end. The character of Devil Star 2 was split into two "Galaxy Girl" characters; "Yana" (in the scene where she attempted to rose-bomb Chief Anderson and Jason) and "Lani" (all other scenes). The female commander was given the name of "Mala" and was identified as Zoltar's sister (see below tropes), while the Galaxy Girls' eventual fates were excised. Comic-Book Adaptation: One by Gold Key in the 70's (which portrayed Keyop as an android, for some reason), and one by Top Cow in the early 2000's. Compilation Movie: In 2002, Sandy Frank recut five episodesnote "Attack of the Space Terrapin", "Big Robot Gold Grab", "The Ghost Ship of Planet Mir", and both parts of "Invasion of Space Center" and merged them together as a 68-minute feature film, titled "Battle of the Planets: The Movie" as a test to see how a compilation film would work. The intergalactic references added to a few of the original scripts were excised, and scenes showing death and destruction had been spliced back in. Although the episodic footage was not redubbed otherwise, the Zark segments were, removing Alan Young's vocals in favor of a modern actor, David Bret Egen. The Complainer Is Always Wrong: A good chunk of 7-Zark-7's dialogue was centered around what a "hothead" Jason was. Darth Vader Clone: Producer Sandy Frank obviously saw Berg Katse in Gatchaman, said something like "close enough!" and renamed him Zoltar. Designer Babies: Keyop is said to have been specifically engineered for the G-Force team by being cloned from a "single embryonic cell". note Although in the Gold Key comics adaptation of the series (which had other continuity issues when compared to the cartoon), he was made into an android to explain his odd speech. Dub Name Change: Pretty much all the characters had their names (and personalities) altered for this version. In the French dub of this adaptation, however, 7-Zark-7's love interest Susan became "5-Cibel-5", for her name to match up better to his. Friendly, Playful Dolphin: Keyop befriends one. Heartbroken Badass: Jason is this trope. Human Aliens: The Spectrans are completely humanoid. —This is because, in Gatchaman, they were human!— The Top Cow comic lampshades this and claims Zoltar's boss the Luminous One grew them from human DNA, to replace the extinct original Spectran race. Ironic Nickname: The Big Guy is named Tiny. Large Ham: The narrator of the opening sequence. Leader Wannabe: Jason, who is annoyed that Mark is the leader instead of him. Mecha-Mooks: Retconned in through Bowdlerization. Mythology Gag: A baby whale in one episode is named "Nambu", after the original Gatchaman name for Chief Anderson. A baseball player in another episode was named "Joe Galactor", referencing the original names for Jason and the Spectra organization. In the Top Cow comics continuity, Princess' unseen friend Jill was finally given a face- that of the OVA design for Jun. As Jun owned the snack bar in the original Gatchaman series (while Princess only worked at one part-time) and was the reason behind the bar being the "Snack J", it's a further nod to the original. Never Say "Die": 7-Zark-7's main role was to explain to the audience that nobody died. Then surprisingly (for its time, at least) subverted when even Sandy Frank couldn't retcon out the death of Colonel Cronus, Mark's father. The producers did not receive the episodes in the Gatchaman order, which had led to some interesting reinterpretations. We ended up with Mark's father said to be dead halfway through the series, and an entire episode revolved around his killer.note This episode originally took place after Red Impulse's death, but was sent and translated as the 30th episode, leading to this oddity. Then suddenly, Cronus was revealed to be Mark's father, and they did Zark his survival. But yes, they could not get out of admitting that some people died. Strangely averted in one episode, where the scriptwriters changed a scene of Ken at his father's grave (the scene having taken place after the above) to Mark mourning an otherwise-unmentioned elder brother that had died. No Communities Were Harmed: In "The Fiery Lava Giant", a monument on an asteroid very similar to Mount Rushmore is the center of an episode. Notable Original Music: People who have seen both BotP and Gatchaman say the music from BotP is an improvement over the disco soundtrack of the original. Notably Hoyt Curtin's original theme song. There's a reason the picture on this page is from the soundtrack CD. Off-Model: The "Ready Room" original animated sequences by Gallerie were FILLED with this for all five G-Force members. The sequences with Mark and Princess visiting Zark also combined this with stiff, blocky limited animation to where they were frozen in the same pose with only their mouths moving most of the time. Pragmatic Adaptation: It is very rare, but occasionally the adapters changed a detail to improve story logic. The first episode is an example; whereas in the original Gatchaman script, the lead hero has to argue why their ship should go into their risky Fiery Phoenix mode to escape a certain death trapped in the villain's mecha, the BotP version has the team having no objections of doing the obvious. Some of Jun's moments of panicking were cut, allowing the rechristened Princess to come off as a stronger character. Dialogue changes also made the character snarkier and ready to quip, although this at times created conflict that wasn't there in the original script.note One episode changed a neutral dialogue exchange between Jun and Joe to Jason giving Princess a Stay in the Kitchen type remark and Princess snapping back at him. Another episode had Princess sarcastically apologize to Mark, who criticized her for not paying attention. Rebel Relaxation: Jason can usually be seen holding up the wall of Chief Anderson's office during briefings. Recycled In Space: Dialog changes and newly animated Stock Footage had G-Force traveling through space. This was the major change to the plot; the terrorist Galactor become the alien invaders (aka "happiness boys") from Spectra. Sci-Fi Writers Have No Sense of Scale: According to the intro, G-Force are "protecting Earth's entire galaxy" from "surprise attacks by alien galaxies from beyond space". She's Intersex In Japan: Zoltar, whose female half was dubbed as his "twin sister" Mala. Although in the original, Berg Katse and the female commander (while hinted to have some strong connection) were not revealed as the same entity until the end of the series, which this version hadn't gotten to. It is unknown how they would have attempted to explain it away, although one of the episodes that were adapted did feature Mark attempting to unmask Zoltar, and long blond hair briefly being shown. Tiny then jokes that Zoltar could be a woman, but nothing more is said on it. A later episode (88) that originally followed up on that scene in Gatchaman was entirely rewritten for this version as "Tentacles from Space". Instead of the Science Ninja Team tracking down a possible connection between Katse and the mysterious female commander, the G-Force team is tasked with tracking down a Spectra agent named "Hannah" who Zark tells us was captured and tried for her crimes by the end of the episode (the commander in the original, however, managed to get away as usual). It's important to note, however, that this episode and episodes 32 and 33 of Gatchaman (adapted as "Curse of the Cuttlefish") were actually sent and translated before "The Galaxy Girls" and "Rage of the Robotoids", which identified the blonde woman as Mala. In said Cuttlefish two-parter, she was referred to as "Agent S-9", and had no apparent familial connection to Zoltar. As a clue to her connection to Zoltar, Mala uses the assumed surname "Latroz" in her first appearance. Ship Tease: Mark and Princess. All the freakin' time. Something Else Also Rises: Zark's antenna tend to stand up whenever he talks with the robot Susan. Techno Babble: "Cerebonic powers," based on super-science implants in their brains: the name seemingly derived from "cerebrum". Which means the good guys apparently stuck experimental technology in the heads of orphans. There is a fan fic that follows this train of thought to its logical conclusion . As in Real Life, there are no easy answers. The Snark Knight: Jason. No-one is spared. Super Mode: The "Fiery Phoenix" form of the Phoenix, G-Force's ship. A last resort transformation for extreme emergencies, the ship transforms into a virtually invulnerable living flame form. Tuckerization: Sandy Frank named the unseen female robot "Susan", after one of his secretaries at the company. Verbal Tic: A side effect of Lip Lock. Poor Keyop. Vocal Evolution: Janet Waldo voiced Princess in a higher tone in the earlier episodes, while ones produced later in the run have her using a lower voice for the character.